Madeleine Suspension Review: Is It Worth It? If we said this is a good piece, would you trust us? Another day in this simulation and we don’t stop! This Tuesday the topic is Madeleine Suspension, a review of this lighting design. 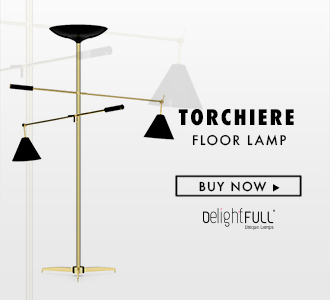 When you finish this article, you will want to click this button to buy the lamp. You doubt it? Keep reading! The best strategy for heightening the effect of pastels is to pair them with crisp white decor accents! For a wide and modern kitchen, you can definitely play around with lighting. The centerpiece of the room is in this case, Madeleine Suspension Lamp. This week’s theme is focused on kitchen lighting. For that reason, we wanted to share with you this special piece for your industrial or vintage interior design. Inspired by a flower bouquet, DelightFULL‘s designers designed Madeleine, an industrial pendant lighting. With four cone swiveling pinhole lights, this brass pendant lamp features a matte white interior and a gold powder paint inside finishing. This white pendant light is also possible to have with an adjustable drawbar so that you can move it anytime. Madeleine is 15,5 inches tall, but it can be customizable on the purchase, being adjustable up to 39,4 inches. Madeleine can complement many lofts, bars, and restaurants, however, this pendant light can go anywhere, adding a vintage style touch to whatever room you decide to hang it in. Light, gentle and elegant this suspension ﬁxture adds a French touch to any cool commercial establishment. The perfect lamp for your kitchen decor, do you agree with us now? Here’s the button again, in case you didn’t click in the beginning! We hope you enjoyed our review of Madeleine Suspension! Let us know what you think by leaving a comment! If you are looking for more inspiration about interior design, the latest trends, and lighting designs, you can find it in the other articles on home design ideas! Alessi has a new collection, and this time it is signed by the amazing Naoto Fukasawa. This collaboration adds to the designer’s ‘cha’ teapot from 2014, showcasing his traditional beauty, contemporary style, and minimalist designs. As part of the range, Nomu – japanese for ‘drink’ – features a ‘caraffa’ jug and ‘thermos’ vacuum flask. Check them out! With minimalist simplicity and clean-cut shapes, steel plays a key role in this collection. Creating linear reflections with its surroundings, the elegant design of the ‘caraffa’ jug is perfect for various domestic and professional settings. Its double stainless steel wall without an air chamber in between guarantees greater thermal insulation and makes it suitable for both hot and cold drinks. Following the gentle slope of the beak, it features a practical and easy to use handle that curves down the side of the jug. Maintaining the clean contemporary and geometrical style, Naoto Fukasawa‘s ‘thermos’ vacuum flask is defined by its simple and elemental silhouette. The lid turns into a practical cup where the hot or cold drink can be enjoyed once poured through the flask’s push-style spout. again, the product is also manufactured with a double stainless steel wall to ensure that the contents are kept at a constant temperature. SEE ALSO: PANTONE DESIGNED A GREENERY-THEMED HOME AND YOU CAN BOOK IT! The incredible open concept kitchen you’re about to see wasn’t always that lovely and that stylish. In fact, when a young couple purchased their modern Craftsman-style home in Georgetown, Texas, they knew they would need to give the dated kitchen and the adjacent living room a complete makeover. Keep scrolling to see the amazing result! Designer Matt Tsang helped the couple create an open kitchen that now includes an eye-catching backsplash, natural elements and mixed metals for warmth and depth. The updated color palette includes light gray walls, a white ceiling and a beautiful tile backsplash in a soft sea-glass hue. The base of the island has a rich gray color that helps anchor the room. Hanna Pendant by DelightFULL, with its structure made in brass reports to a classical ambiance that we believe would look stunning in this scandinavian modern kitchen. A wood-look porcelain tile floor offers durability and warm tones. The tile extends into the living room, which was previously carpeted. Tsang demolished the previous kitchen, pantry and laundry area to create a more efficient floor plan. Removing the old peninsula and pony wall allowed him to extend the kitchen to the former breakfast nook and open it more to the living room. Led Home Lighting for Kitchen is essential for you feel at home. Kitchen is the place of your house where, certainly, you spend more time. Is there that you prepare your food and is a good place to put all family together. And if you are giving a party, it is the best place to talk with people. But do you want a kitchen to only prepare food or to a place full of design for all your family too? The LED illumination will give a brilliant final touch for that place. Think about a functional kitchen and about a good ambience for the moments spent with your loved ones. LED lights save energy and give a warm white light. The innovative designs calls the attention of people that love design. A key feature is its long life without having to replace the lamp.